Unlike cigarettes, cigars have lots of different accessories that help to make the smoking experience more enjoyable, some of which are necessary to do basic functions such as cutting the tips, keeping them at the right temperature during storage, or minimizing the level of cleanup that’s needed once finished. The latter is especially important; smoking can quickly build up debris and trash in an area that is frequented, particularly when there’s no ashtray available. 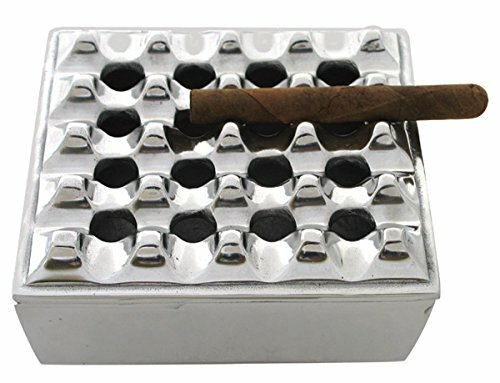 Fortunately, cigar ashtrays are plentiful and come in nearly every shape and size imaginable. Below are some of the best available online, built to keep your smoking space clean and spruce. Be sure to check out the Buyer’s Guide afterward to see which will benefit your smoking style the most. Going back and forth to the trash bin to empty out ash from a conventional ashtray can get old quickly. This can become problematic when there are friends over that wish to partake in smoking with you. Ash buildup happens quickly, and things can get dirty very fast unless preparation measures are taken beforehand. The Big Easy Tobacco ashtray is built with these situations in mind. But it also could find great use from solo smoking. Here’s why. At first glance, the product resembles an ordinary-looking ornament that you would see in a random office space. Its cube-like shape has a top with small ridges lined in four rows, housing four holes in each of the sections. This equals to 16 holes total and is made to dispense ash in the hollowed out interior. As you smoke, simply drop the waste in one of the holes, then place your cigar in any of the slots available until it’s time to dispense more ash again. It’s a great way to keep things sanitary and clean, so long as you don’t let too much ask build up inside. You won’t have to clean it every time you smoke but routine cleanup is recommended around the outside, especially close to the holes. This ashtray is suggested for outside use since the ash will not blow away when it’s confined to the inside of the product itself. It doesn’t weigh too much, so consider adding a little water at the bottom to keep things from moving around. If not, the slightest brush could move it. Other than this, the Big Easy Tobacco is an excellent tray for its ability to hide ash. If you have a smoking area outside, you’ll appreciate having to worry about tobacco particles and such falling on the ground. Sometimes, going the traditional route is the best and easiest product to get when it comes to ashtrays. You might not want something that will end up breaking doesn’t work as well as expected. 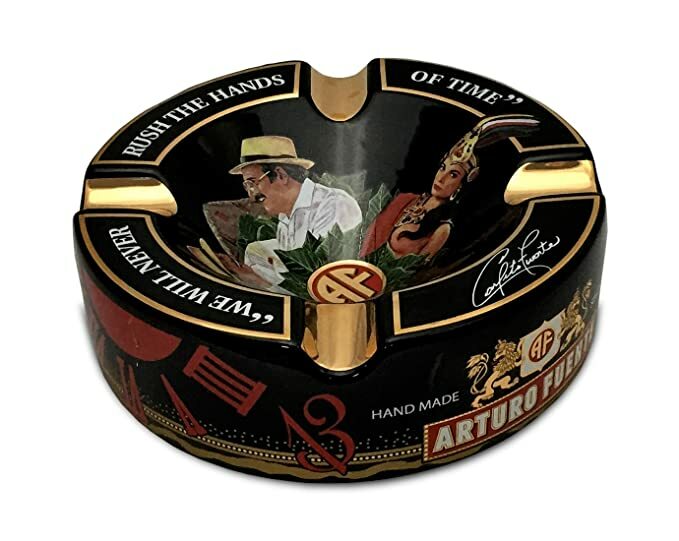 The Porcelain Cigar Ashtray is an ordinary tray that’s decorated with images of the Arturo Fuente brand. It’s beautiful in its own right, so much so that you might even be reluctant to use it. If you do, clean up isn’t a difficult task, so feel free to smoke away. There’s four cigar slots colored in gold highlights, along with a deep center that can quickly be emptied when it begins to fill up. You’ve probably seen ashtray of this type before, so you know how durable the ceramic is, at least when it comes to longevity. The images on the product shouldn’t scratch easily but you should use care if it’s placed outdoors, just to be sure. For this reason, indoor use is suggested overall. Although cleaning isn’t hard, the gunk from cigar residue can increase if you’re not careful. It’s sometimes hard to notice. To remove, take a wet cloth or sponge and gently wipe away until there’s nothing left. Overall, it’s a solid ashtray that will fit well in any smoking or sports room and add lots of elegance to the area when bought as an ornament. 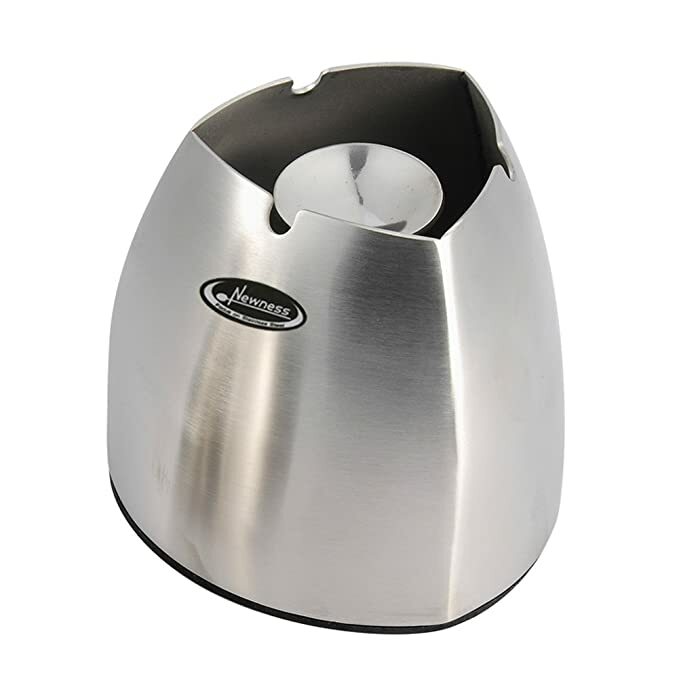 The Ashtray Newness is a large semi-cone shaped tray built of stainless steel parts, an ideal ashtray to use in an outdoor setting. It also looks well indoors. It doesn’t look like your standard ashtray at first glance and has a hollow top with a flat centerpiece (that’s screwed in) that allows up to three smokers to set their products down without them falling into the ashtray itself. The bottom collects all ashes and tobacco debris. Being that this version is large, there’s enough room in the bin to hold a large amount of ash. This is another windproof product. The tray is deep enough to keep everything down in most conditions. If it does fill up, this feature is decreased, so try to clean it once the ask reaches at least one inch in depth. This will also stop fires from occurring inside, which can be smelly and produce a resin that’s difficult to scrub clean. A trick is to add a little water at the bottom, especially if you know it’ll be used for several people. When you are ready to clean, unscrew the rest pad so you can get all the way to the base. Since it’s stainless steel, a pot scrubber should be enough to remove stubborn residue. One big flaw is in the design of the rests. Churchill-size cigars won’t be able to fit inside any of the slots at the top. Other smokes could but will risk breaking if too much force is used. If you smoke cigarillos, this should be less of a burden. Anything larger will have to be placed at the top of the rest, which increases the chance of it blowing into the bin if the wind picks up. There’s also no handles of any kind situated on the outside, so you’ll have to carry it with two hands to avoid dropping it and spilling ash everywhere. Regardless, the Ashtray Newness does make a great cigar ashtray. It could double as a temporary ash bin for a smaller tray that’s used more often, so if you’re looking for something that will cater to a large number of smokers, look no further. Smoking a cigar inside an automobile is not the easiest task to undertake. For those reliant on their car’s ashtray, debris could easily end up on the carpet, soiling the fabric and producing an odor that’s hard to clean over time. The Solar Powered Lightning Ashtray is built to hold cigarettes but can also function as a useful tool for holding and extinguishing cigars. 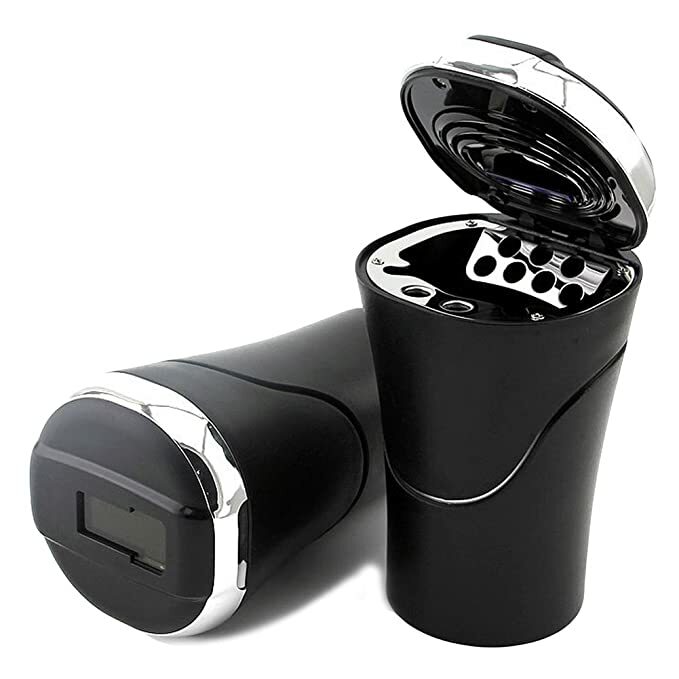 There is a light inside to help you aim the ash at the metal-lined cup inside, so you’ll be able to keep your vehicle’s floor in much better shape than what’s possible in a normally sized car ashtray. Since it gets energy from the sun, you don’t have to worry about buying batteries for the light to work. It has a wide mouth that decreases in diameter at it gets closer to the base, giving it the ability to fit any cup holder. When the lid is opened, place your cigar on the silver colored tray, using care to move it forward as the stick gets smaller. People with sports car might have a bit of trouble doing this without hitting the cup. This is due to the lid stopping at an awkward angle when it’s opened. It protrudes at a 50-degree angle, which is easy to elbow by both front passengers if the holder is located in between the seats. Many sports cars have built without holder in the front, so if you do own a car with such an interior, consider another product to avoid dropping the cigar. But if you don’t think this will be an issue, it’s one of the best ashtrays for night time driving in an automobile. Yeah, you’re probably thinking that buying something as simple as an ashtray probably won’t require knowing any information that you’re already not aware of. But there are some factors that you should keep shouldn’t forget, no matter if you’re aware of them or not. Read below to get a heads up (or refresher). As you know, cigars have a multitude of various shapes. They can be nearly a foot long or smaller than a cigarette. One of the most popular types are Churchills, named after the famed British Prime Minister. Most of the ashtrays reviewed above will have no issues when used with most cigars, but anything larger than 20 millimeters in diameter and seven inches in length will require a larger slot for the cigar to rest upon. If most in your collection are under these measurements, your smoking will be better accommodated with all of the products. An abundance of larger sizes is better suited for the ashtrays with larger holding areas for the ash. Do you smoke indoors or outdoors? Knowing this plays an important part in picking the right ashtray. That’s because products built for indoor use could quickly age when used outside among the elements. However, some smokers will keep their ashtrays inside and only bring them out when smoking is commenced. If you tend to smoke this way, then an indoor piece should suffice. Outdoor ashtrays tend to have better construction, may feature stainless steel parts, and won’t crack or shatter if it’s accidentally dropped when carried around. They may also have a larger holding area for the ash since some prefer to designate one area for smoking. The more smokers, the larger your ashtray should be. That way, you can avoid having to clean up a mess on a daily basis. As described previously, ashtrays are built in two ways. They will be exposed, having a hollowed out portion in the center that collects any tobacco residue, or have this portion covered. The covered trays will possess slots above. Even if ash falls from the top, there won’t be anything to clean as all the rubbish will drop into one area that can be cleaned out at a later time. It’s a good thing to have if you like to run a fan indoors while you smoke, as the ashes remain hidden and cannot fly away when a draft moves across the ashtray itself. They’re often marketed as being windproof and can go outside but refrain from ending up all over the place when gusts of wind pick up. Ashtrays without any protective cover are best used indoors or if you live in a region without strong breezes. After reading the reviews and buyer’s section, you might have an idea on which ashtray you want. If not, the Big Easy and Ashtray Newness showcase to best features for both inside smoking and sessions that take place outside. They are built to last and won’t succumb to erosion or fire damage (so long as you remember to clean them). Getting the right ashtray for your cigars do carry enough differences to warrant a closer look into how they will keep your smoking area tidy. Consider the other products mentioned if you think one of them will be more beneficial to you. Remember, personal preference is everything!